Please send me more information about Combat Turf! Combat Turf™, your newest training partner. Combine the science of turf with the passion of athletics and your athletes will be quicker, stronger and better than ever with Combat Turf. 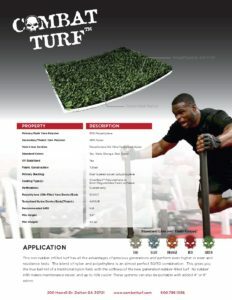 Combat Turf™ is the official agility training turf of the #1 ranked UFC Welterweight fighter Tyron “The Chosen One” Woodley. In his UFC debut, Tyron executed an impressive 36-second KO of Jay Heiron- and put the welterweight division on notice. 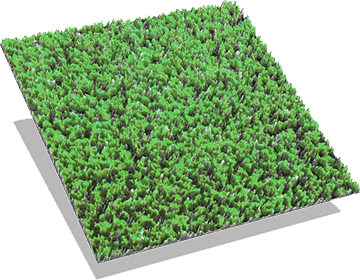 At Sporturf™ we believe that in order to provide a product that will meet the strict requirements of today’s athletes it takes years of dedication and hard work. That is exactly how we created our Combat Turf™ so you, your athletes and facility are always prepared. Combat Turf has all the advantages of previous generations of turf but it performs even higher in wear and resistance tests. The blend of nylon and polyethylene is an almost perfect 50/50 combination. These systems can also be portable with added 4″ or 8″ Velcro.